If you have never heard of food truck parties, you should. They are an incredibly easy way to throw a party, and are delicious, too. We recently hosted a party catered by South Fork, and it was perfect. They pull right into your driveway, and hang out for a few hours. Your guests can wander out as often as they wish to order their dinner. Best of all, chef/owner Phillip Gerringer, who was once Sous Chef at Mono Loco, is one talented dude in the kitchen. 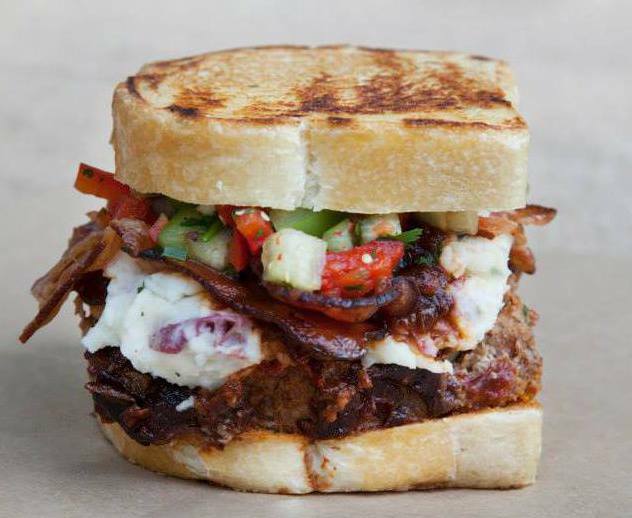 Our guests loved the Smoked Jalapeno Meatloaf Sandwich (pictured) with garlic mashed potatoes (on sandwich), green tomato salsa, chipotle BBQ, and bacon on sourdough. Also delicious was a Catfish Sandwich special added to the party menu at our request. Meanwhile, our vegetarian guests had a hard time deciding which was better: the excellent Lima Bean Hummus topped with roasted tomatoes, and served with tortilla chips, or the more indulgent Grilled Pimento Cheese Sandwich w/ arugula on toasted Mission Home wheat bread. But, the most addictive dish of all may have been the Sweet Potato Fritters with brown sugar sauce, which work equally well as a side as they do as a dessert. The truck was such a hit with guests that one even hired them on the spot for a party a few weeks later. Delicious, reasonably priced food, made to order. No cooking or clean-up, so you can focus on the drinks and the company. They even bring a garbage can to take away all of the trash. Hard to beat.